Healthy sleep formula with calming effect. 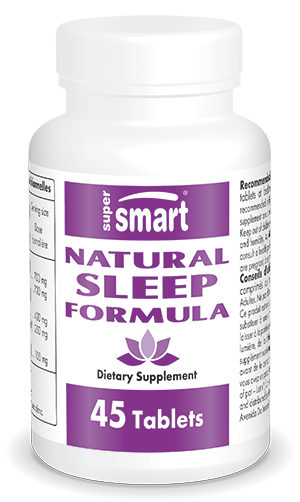 Natural Sleep Formula contains ingredients that act synergistically to help naturally restore good quality sleep, without the common side-effects of sleeping tablets. ¤ Valerian root extract has a tranquillizing effect. Valerian is traditionally used to reduce nervous tension, particularly in the case of sleep problems. Controlled studies have shown that valerian root extract reduces the time it takes to fall asleep and improves the quality of sleep. One study found that valerian extract increases the percentage of the slow wave sleep phase, the deepest and most restorative phase. The efficacy of valerian extract when combined with hop extract has also been demonstrated. The ability of L-tryptophan to induce drowsiness was first recorded in 1962. Over 50 studies examined the effects of tryptophan as a sleeping aid and the consensus was that even at a low dose, it can halve the time it takes to fall asleep in cases of mild insomnia. It also improves sleep quality. ¤ Rhodiola rosea root extract acts as an adaptogen, modulates the production of stress hormones and helps maintain the balance of other hormones. Older people have raised stress hormone levels during the night which can affect sleep. Rhodiola rosea root extract re-establishes hormone equilibrium, thus promoting drowsiness and improving sleep quality. When given to students during exam periods, Rhodiola extract reduced mental fatigue, improved sleep habits and decreased sleep requirements. ¤ Hop extract is traditionally used, in particular, for its sedative and hypnotic properties in cases of sleep disorders. It helps relieve tension and anxiety. Several studies have shown that combined with valerian, hop extract offers an alternative to benzodiazepines for treating occasional, non-psychiatric sleep disturbances. ¤ Eschscholzia californica root extract contains alkaloids : protopin, in particular, has been shown to increase the attachment of GABA to post-synaptic membrane receptors in rats. In mice, an aqueous extract of Eschscholzia showed a dose-dependant effect. In humans, clinical studies have shown that Eschscholzia is effective in improving sleep problems : it reduces the time it takes to fall asleep and improves sleep quality.